Rustam Kasimdzhanov (Uzbek: Rustam Qosimjonov; Russian: Рустам Касымджанов; born 5 December 1979) is an Uzbek chess Grandmaster, best known for winning the FIDE World Chess Championship in 2004. He was born in Tashkent, in the former Uzbek Soviet Socialist Republic. He is an ethnic Uzbek. His best results include first in the 1998 Asian Chess Championship, second in the World Junior Chess Championship in 1999, first at Essen 2001, first at Pamplona 2002 (winning a blitz playoff against Victor Bologan after both had finished the main tournament on 3½/6), first with 8/9 at the HZ Chess Tournament 2003 in Vlissingen, joint first with Liviu Dieter Nisipeanu with 6/9 at Pune 2005, a bronze-medal winning 9½/12 performance on board one for his country at the 2000 Chess Olympiad and runner-up in the FIDE Chess World Cup in 2002 (losing to Viswanathan Anand in the final). He has played in the prestigious Wijk aan Zee tournament twice, but did not perform well either time: in 1999 he finished 11th of 14 with 5/13, in 2002 he finished 13th of 14 with 4½/13. Kasimdzhanov's 2004 championship victory earned him an invitation to the eight-player FIDE World Chess Championship 2005, where he tied with Michael Adams for 6th-7th place. The 2004 championship also earned him one of sixteen places in the Candidates Tournament for the FIDE World Chess Championship 2007. His first round opponent was Boris Gelfand. In their match, all six regular games were drawn. Then Gelfand won the rapid tie-break 2½-½, eliminating Kasimdzhanov from the tournament. He made his first appearance at Linares in 2005, finishing tied last with 4/12. 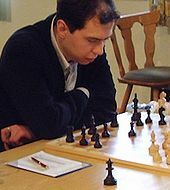 In 2006, Kasimdzhanov won the knockout Corsica Masters tournament. He was a second for ex-World Champion Viswanathan Anand, having worked with Anand in preparation for and during his successful World Chess Championship title defences in October 2008 against Vladimir Kramnik, April-May 2010 against Veselin Topalov and in May 2012 against Boris Gelfand.